Beautiful Picture: Grease Is The Word. Beautiful Picture: Grease Is The Word. Home » Hair » Review » Grease Is The Word. If you follow me on twitter or listened to me complaining about my hair at the Body Shop event (haha sorry), then you will know that i have had major issues with it being greasy as soon as i'd washed it. It just wouldn't stop being greasy. Batisting it out...that didnt work. No amount of dry shampoo would lift it. and yes, you guessed it...none of the above worked. Here are some GLORIOUS photos of my lovely greasy head. You may vom if needs be. These photos were taken literally 2 minutes after blowdrying. Sorry if the photos were crap...its hard taking a photo of the top of your head. The greasyness is in the crown and some in the fringe. My hair has been SO limp, even backcombing didnt achieve any volume. "yeh yeh, but thats what you shampoo you're hair for"
She advised me to get the Boots product build up shampoo & linked me to her REVIEW. She had the same problem and voilaa, this little beauty of a product sorted it all out. 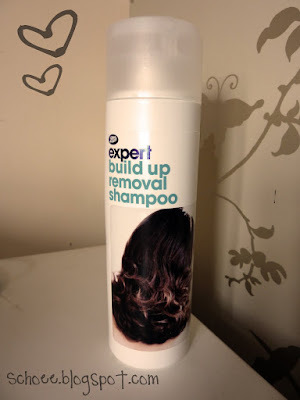 I dont often see many hair products that offer to remove build up product, and actually, when i was scouring the shelves for this..i saw nothing that claimed to do the same thing. I have just done the test & washed my hair twice with the shampoo & nothing else. No conditioner, no serums or lotions before or after blowdrying. The results are far better than i expected. I dont have any grease in my hair, it feels SO soft and sleek. It actually feels as though i've had my hair washed and blowdryed in a salon. I seriously cannot thank Arlene enough. and remember girls, don't ever underestimate the "own brands"